In the recently concluded game no 19 of VIVO Indian Premier League (IPL), 2019 between Sunrisers Hyderabad (SRH) and Mumbai Indians (MI), MI won the match by 40 runs. Mumbai Indians new find Alzarri Joseph breaks former Rajasthan Royal bowler Sohail Tanvir' record of 6/14 by finishing with the figures of 6/12. SRH vs MI Highlights IPL 2019: Alzarri Joseph Registers Best Figures in Indian Premier League History As Mumbai Indians Beat Sunrisers Hyderabad. Mumbai Indians were put into bat first by SRH captain Bhuvneshwar Kumar, where Mumbai posted a total of 136/7. In that reply, SRH inning succumbed to a total of 96 in 17.4 overs. This was indeed a horrible batting performance by Sunrisers Hyderabad. 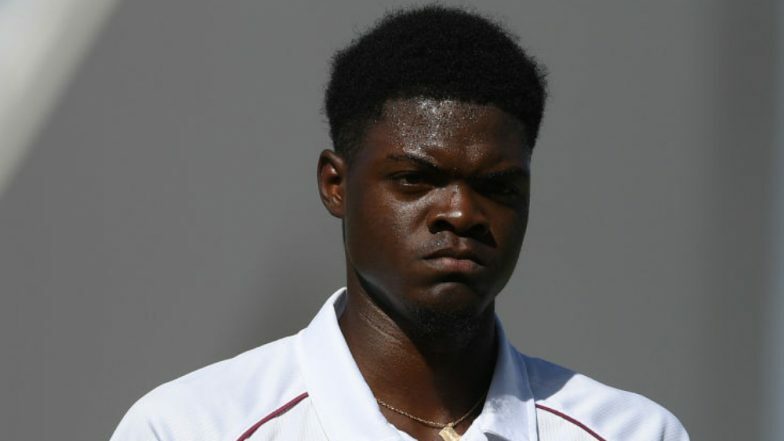 The Carribean player Alzarri Joseph made a debut in this game against SRH, where he ran through the Hyderabad batting line-up. Alzarri took the wicket of star batsman David Warner on his very first ball in IPL. The 22 years old Windies player hails from Antigua and play for West Indies in Test, ODI and T20. SRH vs MI IPL 2019: Kieron Pollard's One-Handed Six Off Siddharth Kaul Will Leave You Stunned, Watch Video. Alzarri Joseph has made his country proud by the way he had performed against SRH. The previous best bowling figure record was held by Sohail Tanvir, who took 6/14 against Chennai Super Kings (CSK) in IPL Season 1. Australian bowler Adam Zampa also came close to break this record while playing for Rising Pune Supergiants where he took 6 wickets and conceded 19 runs against SRH. Even star bowler Anil Kumble is in the list of cricketers who have taken 5 wickets in IPL, one cannot forget his figure of 5/5 at Cape Town against Rajasthan Royals (RR) in IPL 2009. Even Ishant Sharma and Lasith Malinga are part of this 5 wicket haul list in IPL. Mumbai has now 6 points to their name and after this victory has helped them to reach number 4 on the points table. Mumbai has now won two matches in a row with a good margin, as their previous win over CSK was also by 37 runs. Mumbai Indians has all the reasons in the world to cheer up as they have found one more pace bowler Alzarri Joseph who had a dream debut in IPL.